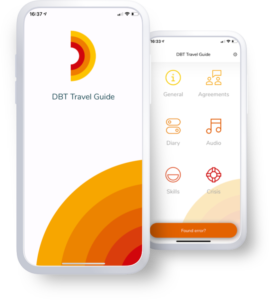 DBT Travel Guide contains more than 200 different skills- and mindfulness exercises. The app can provide guidance during crisis moments via the crisis option. There is a ‘think of’ scheme for the DBT therapist, included with practical instructions. Besides, there is the possibility to write down agreements between the client and the therapist and to digitally fill in the diary. If you download the Dutch version of the app, you can select English as user language. The app can be downloaded in the Google Play store and the App Store. Questions and/or remarks concerning the app? Please let us know by emailing info@dialexisadvies.nl. 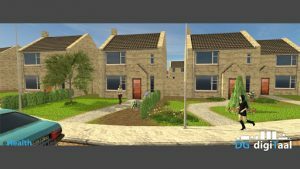 DG digiTaal is a serious game in Dutch in which you walk around in a virtual city and gets the opportunity to practice various (learned) skills. This virtual environment ensures that the client is able to start practically. The game is intended for young people aged 12-18 years with mood swings and emotional regulation problems. The assignments are based on the 4 modules from the DBT skills training and are discussed proportionally. DG digiTaal has been developed by Jacomijn Jacobs and Rob Reijnen, in collaboration with Kinder- en jeugdpsychiatrie Karakter. Here you can find more information (in Dutch) and to play the game. Download the app in de Google Play store of App store (also in Dutch).